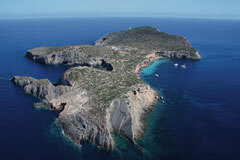 A unique and private Mediterranean island, next to Ibiza and the most exclusive way to enjoy Ibiza from a distance! This natural private paradise is an idyllic location to spend your holidays, celebrate private parties like birthdays and weddings or simply relax in complete peace and quiet. You can arrive by helicopter for an executive business meeting or use the island for stylish product presentations and photo shoots. The stylish and spacious luxury villa on the island offers 5 interior designed suites, all mod cons including wireless internet and state of the art Bang & Olufsen sound system. 24-Security (CCTV surveillance system), the island is only accessible on the west coast A boat for the transfer from Ibiza- Tagomago and back is incorporated in the charge, only the fuel consumption will be charged extra. A private yacht is available for rental. This service does have an additional charge. The villa has been completely reformed between 2008 and 2009 to a very high standard with a modern and sophisticated style. The property features five luxury double suites with large private terraces offering panoramic sea views to Ibiza. Five en-suite bathrooms, a master bedroom with separate dressing area and with custom designed walk-in closet. Floor to ceiling impact resistant glazed windows and exterior doors High-tech sound system from “Bang & Olufsen, Internet with WiFi, LED light system. Customised designer kitchen with professional equipment. All rooms are modern and trendy and were decorated by internationally well known interior designers. Special rates apply during Christmas and Easter holidays, please enquire. The rental includes accommodation for maximum 10 adults in 5 suites and includes meals. The rate includes four service staff during entire stay. Helicopter transfer from and to the airport of Ibiza on the arrival and departure days (ask for details) for maximum 10 people at a minimum stay of seven days. The rental includes a private cook and kitchen staff. Guests can dine indoors in the dining room or outdoors. 24hour service is offered during the stay by the personal butler and staff quarters are available for guests with their own staff. Nearest airport: International flights arrive in Ibiza. Short journey by car and then boat transfer from the harbours at Pou des Lleó or Santa Eulalia to the island. The island has a heliport and a helicopter is available at additional cost. A boat for the transfer from Ibiza- to the island and back is included in the rental, only fuel consumption will be charged extra. A private yacht is available for rental. This service does have an additional charge.